When it comes to environments, there’s simply no telling where an AC drive will be installed. Installations in industrial applications can be some of the harshest. Drives must be designed from the heatsink up, with many different applications in mind, and with the ability to deal with different climates, power sources, motor types and distances while being operated from a local control panel, fieldbus or discrete input/output (I/O). Not considering the environment from the beginning can result in a combination of increased maintenance costs, higher service costs, a decrease in operational reliability or, worst of all, more downtime. In the past, this blog has brought you a series of posts (It’s a harsh world…) that take a fairly detailed look into what kind of impact the installation environment can potentially have on your AC drive, and what are the appropriate precautions that can be taken to protect your investment. Topics included drives installed in locations with extreme temperature ranges, humid or corrosive conditions, high vibrations or in dusty environments. This post, which assumes the drive is sized for appropriate control of the motor and application (voltage, power, response time and I/O needs), contains more best practices for trouble-free operation of your drive and application in the location in which it is installed. – Mechanical: is an enclosure needed for the environment in which the drive is installed? – Input power: what and how stable is the power source? – Motor wiring that powers the motor. – I/O: wiring installed and routed to control the application. – Fieldbus wiring for control and monitoring without interference. When selecting AC drives, many aspects are reviewed. The product must be able to drive the motor without interruption whether it runs for minutes, hours or 24/7, 365 days per year. Ideally, an engineer could design the application from the ground up and all the necessary components would be considered, but this is often not the case. New installations in existing facilities, retrofits and upgrades take place every day. The following information helps provide the best opportunity for trouble-free operation. Space around the AFD allows air to circulate and around it for proper cooling. The manufacturer provides recommendations for space above, below and on the sides. In some instances, drives can be mounted side by side with no space around them. Aggressive gases such as hydrogen sulfide, chlorine or ammonia can damage AFD electrical and mechanical components. Cooling air contamination can cause gradual decomposition of polychlorinated biphenyl tracks and door seals. A clear sign of an aggressive atmosphere is corroded copper. In aggressive atmospheres, enclosures and conformal-coated circuit boards are recommended. Read more about Drives vs Enclosure classes. Understanding the power source (230, 460, 600 volts) is critical when selecting an AC drive. In some remote locations, only single-phase power is available, which requires a special design. In new designs, this information is readily available. – Do power quality issues exist? This may require the use of a drive with a direct-current choke or line reactor built in or the use of an external reactor or isolation transformer. When wiring cables for input power, size wiring based on the AFD’s input current and comply with local and national electrical codes. Because these cables carry high voltage, they should be kept away from control wiring, other power wires and motor wiring to avoid inducing voltages in other cables. Wire used between the drive and the motor should be reviewed. In a retrofit when replacing a starter or contactor with the drive, consider that motor wiring in the past may have been individual conductors in a conduit. AC drives use insulated-gate bipolar transistors to the drive output to control a motor and vary speed. The cable must be sized correctly and designed for its installation location. Along with the cable, the right drive and motor combination is needed. Consider if the environment has moisture, oil or potential for the cable to be crushed to select the appropriate cable and if a specific conduit is needed. The best cable to use is one designed for AC drives. This cable will provide the necessary conductors for the motor: a ground and a shield. Grounding and the use of the shield are vital when it comes to higher frequency switching at output terminals. Grounding is done for safety and provides a path from the motor back to the drive using single-point grounding. This means the ground conductor is connected at the motor and to the ground terminal on the drive. This single-point grounding technique is designed to keep the high-frequency noise generated between the drive and the motor so it does not spread to other equipment. For drive installation on an older motor, an output reactor and a dU/dT filter are recommended to protect the motor from peak voltages that can occur at motor terminals because of reflected waves. – Follow the motor manufacturer wiring requirements. Control wiring integrity is critical. The control wiring for digital and analog signals, fieldbus cables, safety circuits and feedback devices require shielded cables and separation from power and motor wiring. If control wiring needs to cross power or the motor, do so at a 90-degree angle. Choose wiring designed for the signal carried, voltage and current rating. Use the shield to protect against crosstalk. The cable from a remote, mounted control panel is often overlooked. This cable needs to be routed away from power and motor wiring as well. Manufacturer recommendations and manual instructions provide the best installation information and the best opportunity for trouble-free operation. If a deviation occurs, use the checklist below to run through each installation area. Some areas may not apply or can be changed because of cost or how and where they are installed. Try to reduce the amount of deviation from the manufacturer’s recommendations and follow local and national codes for installation and wiring. 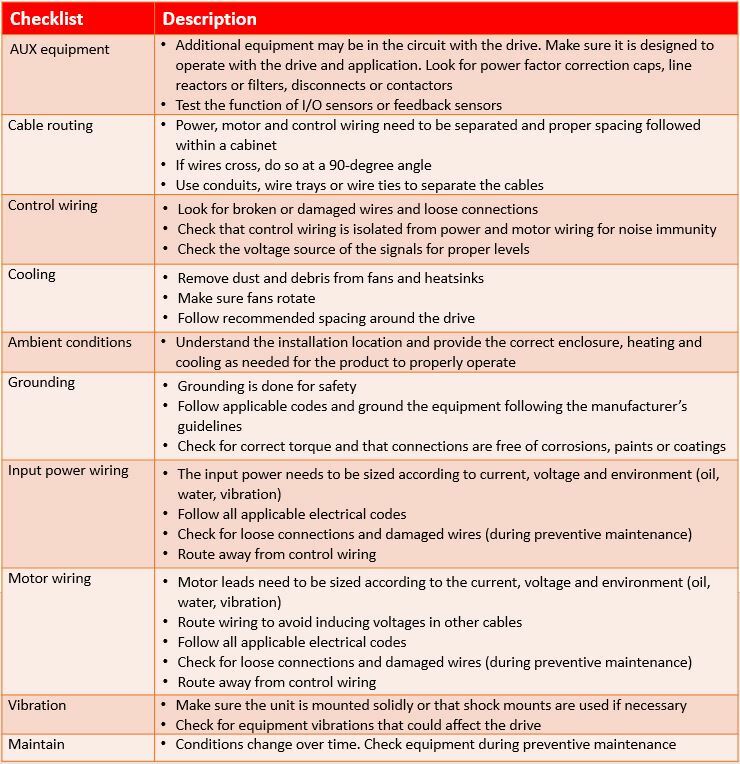 Checklist: Select the drive and motor that work best for the application. Danfoss AC drives are motor-independent. Keep following this blog for regular updates on the best ways to ensure that your investments in AC drives are always the safest investments around. And let us know in the comments box what environmental impacts give you the biggest challenges and how we can help you overcome them. Regardless of whose name is on the label, we’re here to help! In the meantime, you can find out more about all our products here.